The working conditions of a teacher impact decision making of men and women considering a career in education. The modern classroom has come a long way from hard desks lined up in precision. Working conditions vary greatly from one school to another. School staffing is about more than just finding teachers to work in schools. It's also important to retain food teachers. The working conditions of a teacher will contribute to a school district's retention of that teacher. Teacher retention benefits current and future classes. Constant turnover of new teachers leads to students coping with a stream of novices in the classroom, this contributes to academic breakdowns, failure to notice specific academic problems and eventually to an environment where the students have to teach as much as to learn. Many school districts provide strict curricula that teachers are expected to instruct the students in. These guides are published at the beginning of the school year and require little in the way of interfacing with the instructor about what they will be teaching. This method alleviates the pressure on the instructor to create a program of study, but it increases the pressure to match their classroom needs to the school district demands. Some teachers feel that they should have more support to change their curriculum to meet the needs of the classroom. For example, in one local Dallas area school, the teachers must teach certain subjects in a certain order, religiously. They are not allowed to deviate, even if all their students have accomplished the goals of the current achievement oriented program. Those who don't like this type of teaching environment feel that it can lead to classroom boredom for instructor and students. Current working conditions require that teachers persistently educate themselves in order to be the best they can be for their students. Educational goals are set by the school district and they include on site seminars presented by the school district as well as private education via local colleges and trade schools. Each district institutes its own policies and requirements. 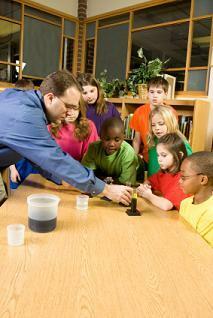 The funding for most of these educational initiatives often comes out of a teacher's pocket. To become a teacher in most public schools requires a Bachelor's Degree in an associated subject as well as certification by the State Board of Education. To become a substitute teacher, a person needs a driver's license and the ability to sign an application. Substitute teachers, by the very criteria used to hire them, are not required to be 'teachers,' but merely placeholders. This is an attitude promoted by the hiring practice, the staffing practice and unsurprisingly, the students. If a substitute teacher is brought in, the teacher must leave them detailed instructions on everything from the lesson plan to the specific medical needs of the individual students and dismissal practices. The expectation is the substitute will not teach, but merely pass out work and play hall monitor until class is dismissed. This does not provide a supportive atmosphere for teachers to accomplish their goals and help the students meet their own. This is also not an atmosphere that promotes substitute teachers excelling as teachers themselves. Since the early 1990s, the working conditions have increased the level of stress felt by teachers as they are required to be familiar with first aid, administration of safety protocols and medications specifically required by their students. They must maintain a pristine classroom that does not allow contaminants, specifically allergens, to come into contact with their students. Teachers need working conditions where they have adequate resources, a supportive paraprofessional staff, and manageable class sizes and reduced intrusions on their instructional time. The best teachers can be crippled by bad working conditions.